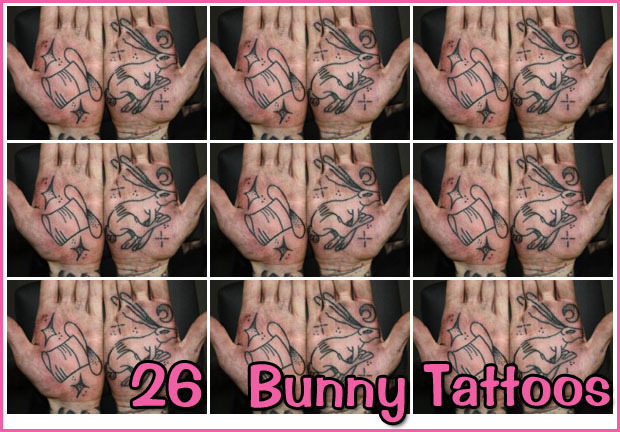 [UPDATE 3/28/12:] Now that you’ve refreshed your summer wardrobe with our compilation of 26 bunny tee shirts, you need a tattoo to match. 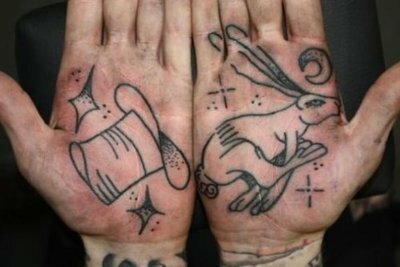 To wit, we’ve updated our initial list of 10 rabbit tats with 16 new entries. Collected from Internet burrows both big and small, we’ve sourced a new batch of lapinspired (editor’s note: did you see what we did there?) 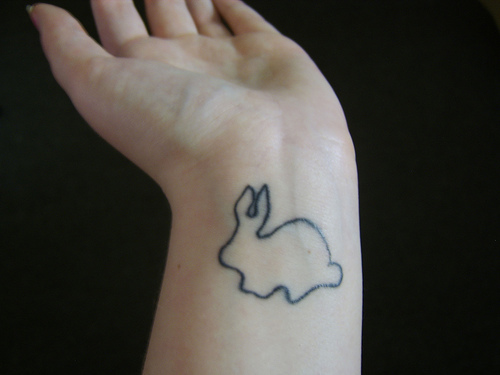 ink that is even cuter, zanier, and more extraordinary than the first. Did we succeed? Let’s take a look-see. 1. 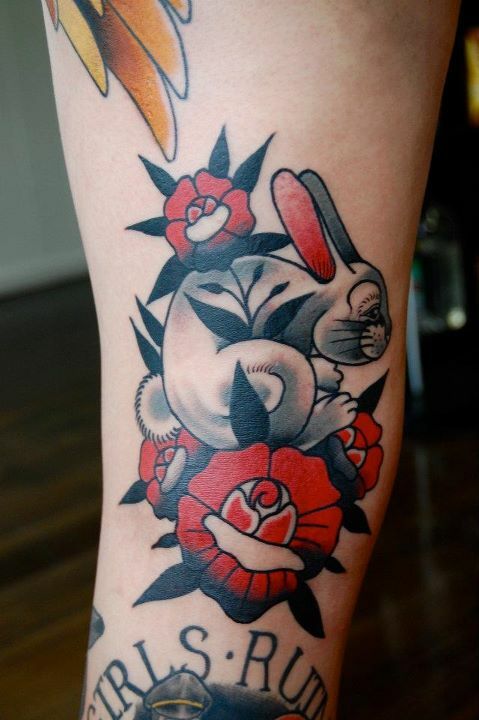 I love this tattoo by Black Garden Tattoo‘s Matty D’Arienzo. The soft lines contrast wonderfully with the pointed flower leaves with an effect that is equal parts tough and tender. 2. 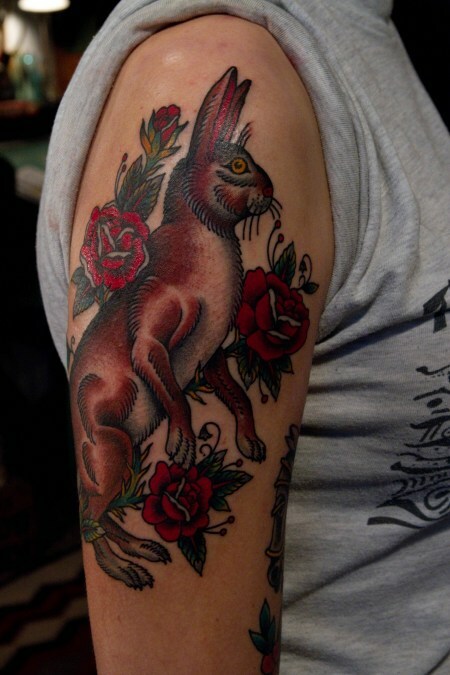 This shoulder piece was listed in All Fun 24‘s list of rabbit tattoo designs. It’s sweet with out being cutesy, austere without being pretentious – perfectly walking all the lines that make a tattoo perfect. 3. 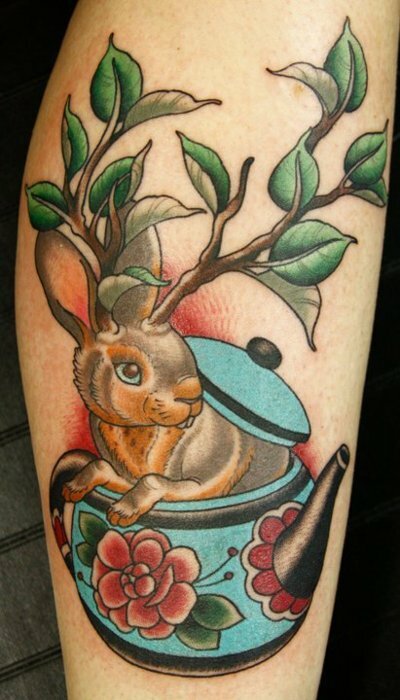 There’s something about rabbits in teapots that people really seem to love. Whether it’s the serene domesticity embodied in both symbols or perhaps the oblique Alice in Wonderland reference, we’re into it. 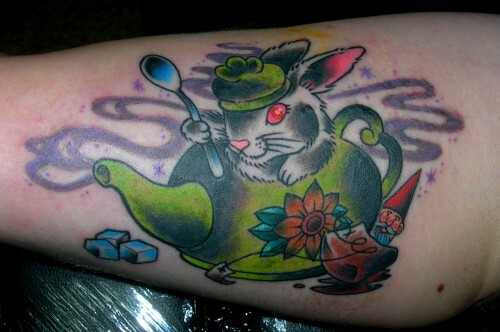 Plus, with this little rabbit on your arm, you’re never without a teatime companion. 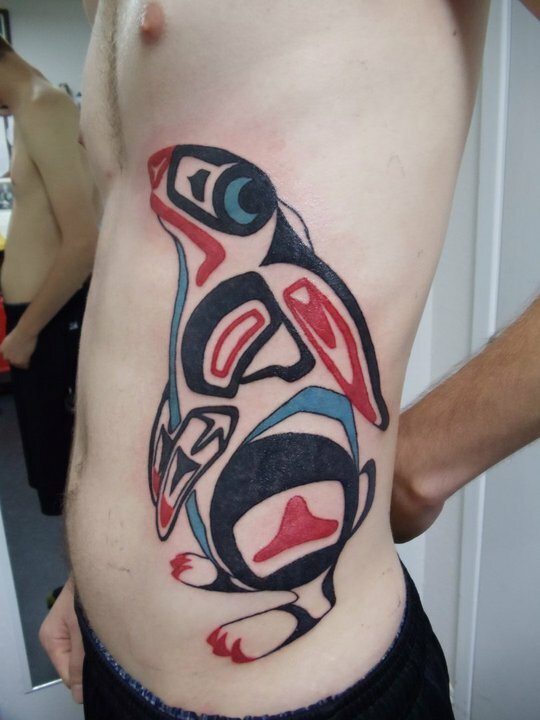 (Found @ Trad Tattoos Tumblr). 4. Sometimes you need a Dissapproving Rabbit (RIP) to keep you in check. 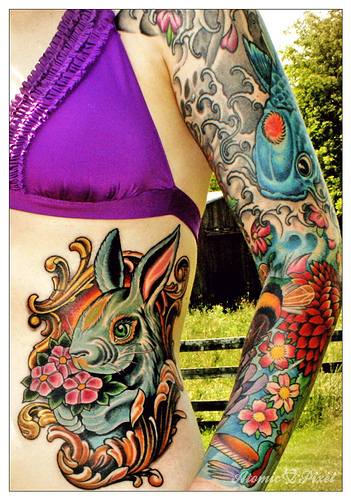 We found this Guen Douglas piece on the Eff Yeah, Tattoos! Tumblr, and it was love at first disdainful glare. 5. 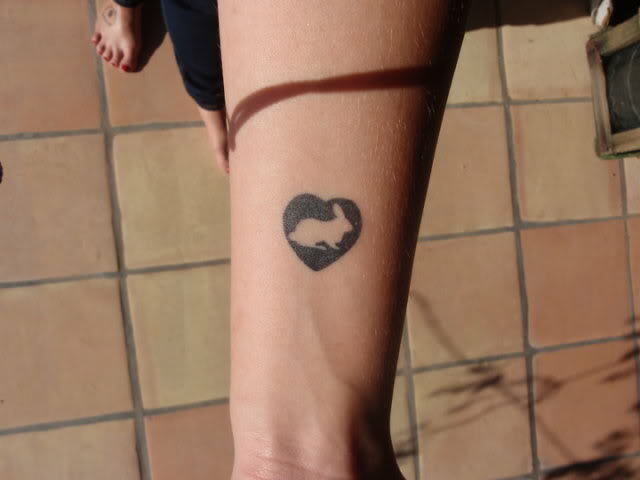 This tattoo is devastatingly cool, as in “I’m so devastated that I’m not as cool as your cool tattoo.” Seriously. 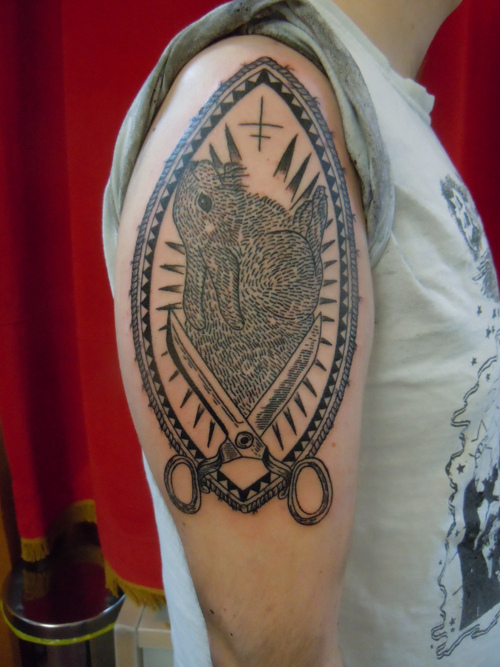 I don’t dare make a pun about this piece by London tattooist Lyam Sparkles for fear that the image would leap out of my computer screen and smirk scornfully at my utter lack of style and design acumen. 6. 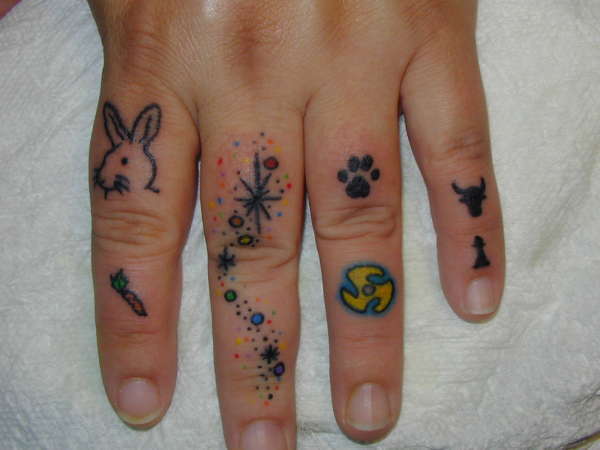 “And now, for my next trick, I will explain how any of these finger tattoos are relevant to one another!” But just because I’m in the dark about how a rabbit with a carrot, some sparkles, a steer, a chess piece, a cog and a paw print all come together, that doesn’t make these tattoos we found on Rate My Ink any less charming. 7. I know I’ve made this joke before, but gosh-darnit!, here I go again. Mess with the bull and you get the horns. 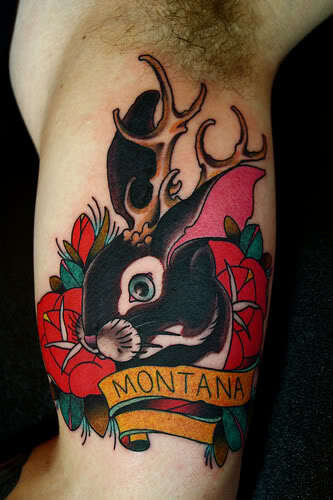 Mess with the Montana jacaklope and you get… this piece spotted at the Rabbits Online forum. 8. 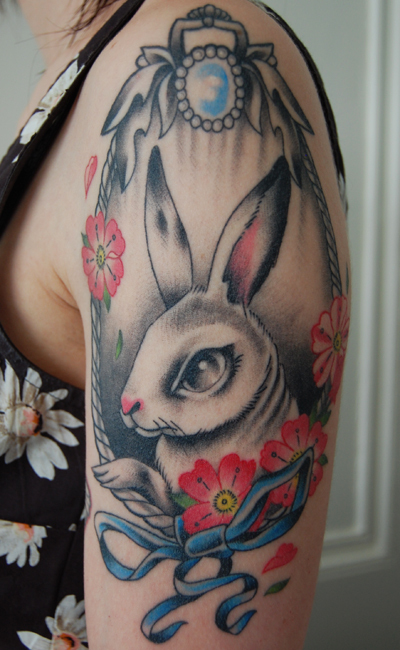 The colors on this rabbit tattoo – spotted at Of Tattoo – are incredible. 9. 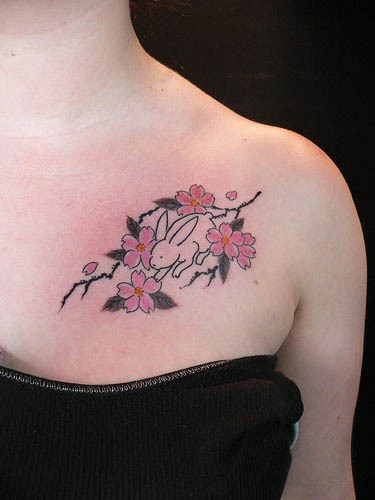 The owner of this tattoo – inked by Sodapop at Ink Spot Tattoo – wrote to Eff Yeah, Tattoos! citing Pink Floyd and his “own journey to finding meaning/motivation” as the inspiration for this cheerful piece. 10. This is the most humane way to catch a rabbit I’ve ever seen. So, kudos to this lovely Tumblr-er. 11. 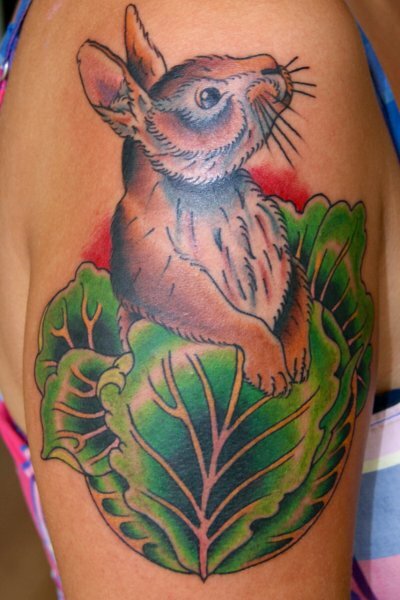 “I’m as happy as a rabbit in a field of lettuce.” That’s a pleasant sentiment to immortalize on your upper arm, certainly. 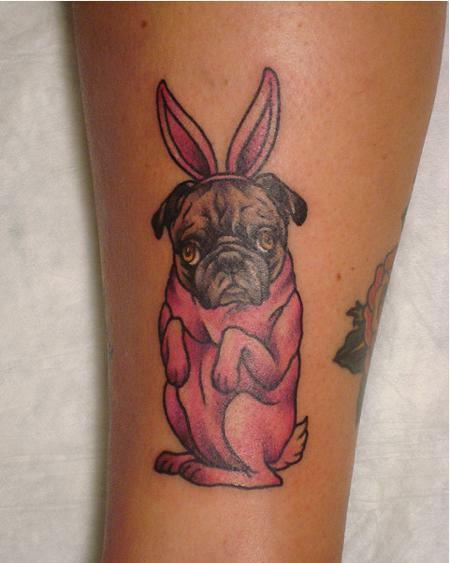 (Spotted @ Animal Tattoos). 13. … and this one from a member of the Rabbits Online forum expressing her support for rescuing rabbits. <3 Bunnies <3[/caption] 14. 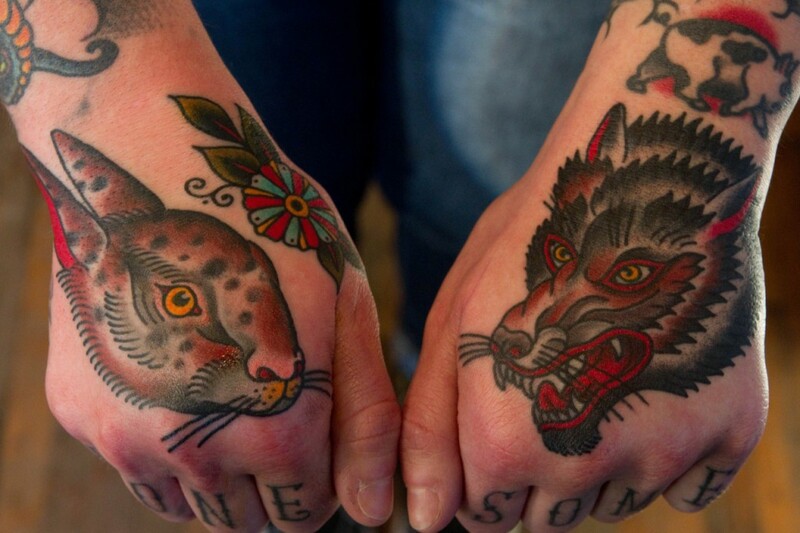 Here are two just mind-blowingly incredible tattoos by Bailey Robinson at The Fabled White Buffalo Co. The first, I assume, is a visual exploration on the interplay of good and evil in an individual. 15. Though the symbolism is less clear in this piece, the work is no less breathtaking. 16. A personal fave, the source for the header image above, and THE classic trick by which magicians are measured. 17. 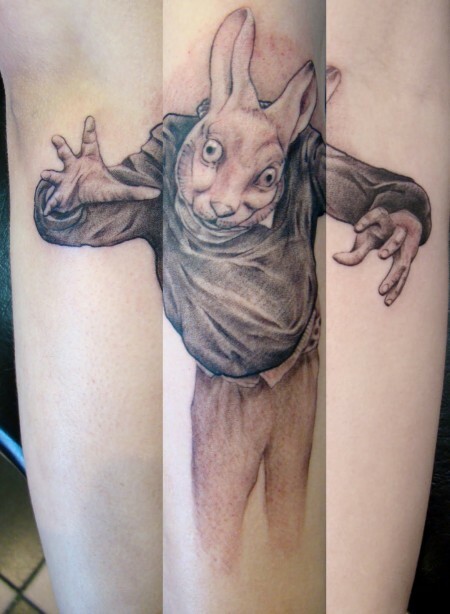 The Velveteen Rabbit – classic! Apparently, this tattoo is unfinished. 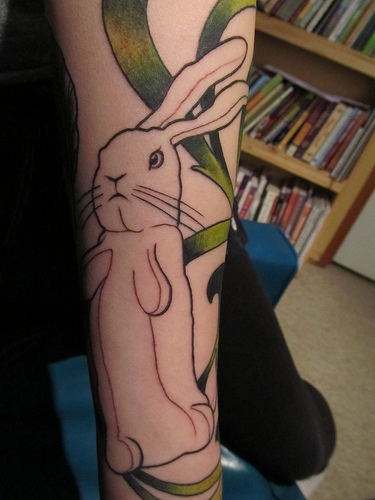 Imagine how good it will look when it’s completely colored in. 18. Tea time is all the time with this little bunny on your arm. 19. The zombie bunny ghost of Mr. Rogers? A handsy grandfather rabbit coming in for hug? ‘Not quite sure what this person was going for, but whatever it’s meant to be, ’tis pretty neat. 21. 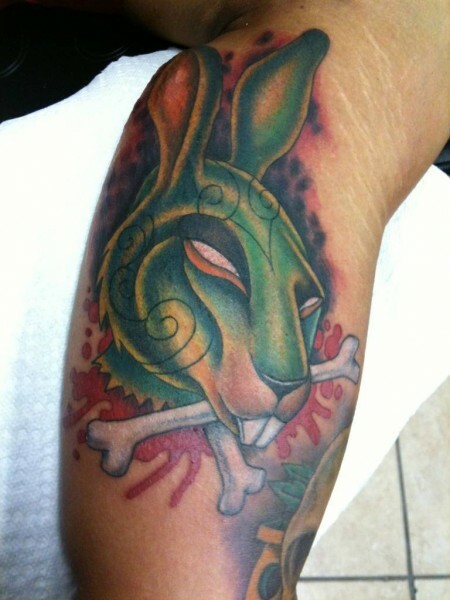 This Chinese zodiac rabbit tattoo symbolizes the wearer’s kindness, artistic taste, and good sense. Her ability to pull off a purple bikini probably has little to do with her Chinese zodiac, but is commendable nonetheless. 22. For cute junkies, just browsing Cute Overload a few times a day isn’t enough! 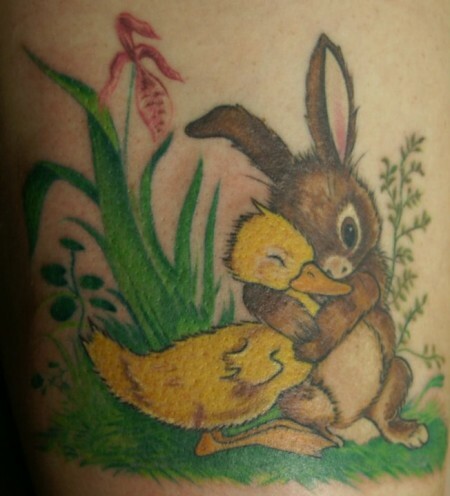 These fiends jones for the ultimate fix – getting a highly visible tattoo of two adorable animals in a friendly embrace. 23. 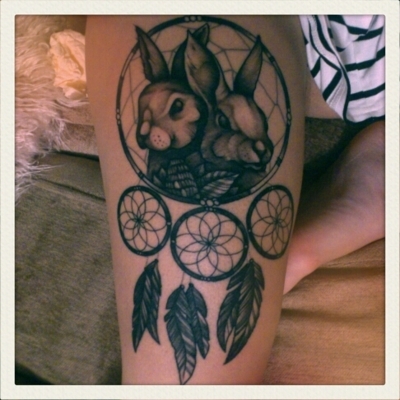 More wisdom and menace than fluffy tails and pink noses, this isn’t your typical bunny tattoo. Sure – it’s the year of the Rabbit, but it’s also 2011. We’re playing by our own rules. 24. 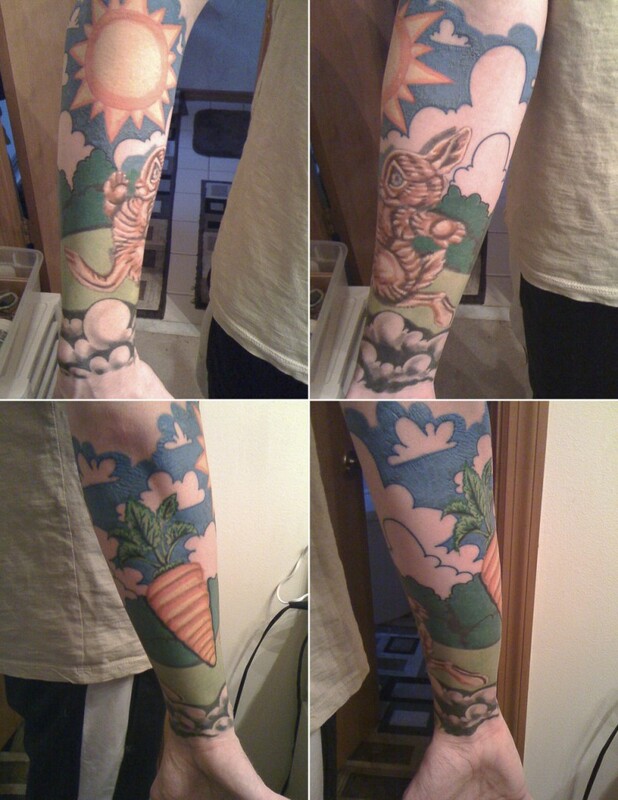 A list of rabbit tattoos simply wouldn’t be complete without at least one old school Bugs Bunny tattoo. 25. 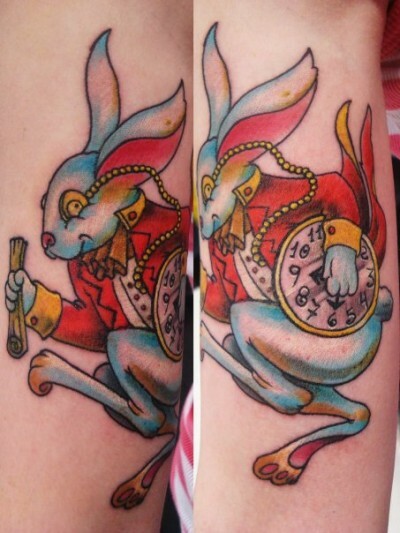 The white rabbit appeared first in Lewis Carroll’s Alice’s Adventures in Wonderland, but the wearer of this vivid, colorful tattoo chose to get it after seeing The Matrix. Follow the white rabbit – you never know where he will take you. 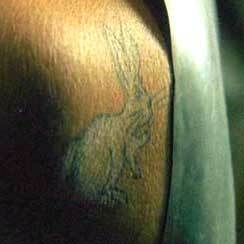 Note that it differs from the rabbit tat that’s actually featured in The Matrix. Watch it below at the 1:01 mark. 26. 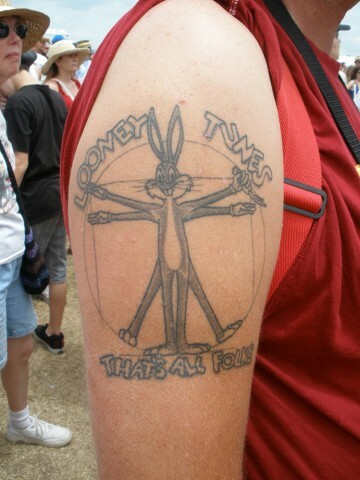 This tattoo is the antithesis of the Looney Tunes tattoos middle age men. When this wearer was hit with a bout of nostalgia, it manifested itself in an adorable tribute to another classic literary bunny, Beatrix Potter’s Peter Rabbit. This entry was posted in Bun Fun, Bunnies On Film, Cute!, Easter Bunny, Famous Rabbits, Hop Art, Lists, Rabbit Memes on May 27, 2011 by BunnySlippers.